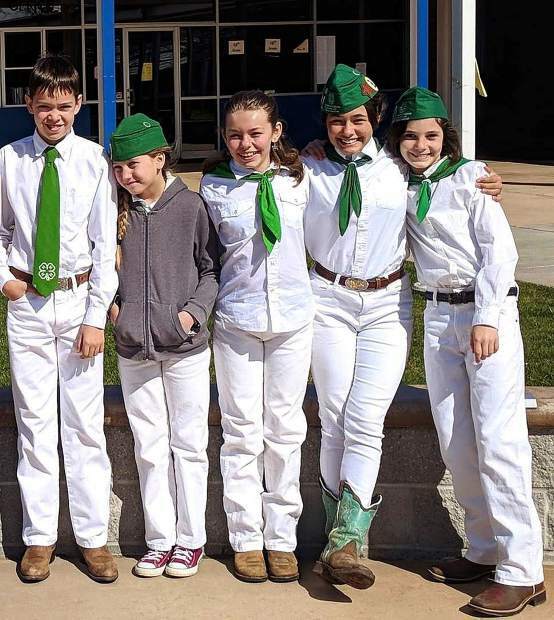 Nevada County 4-H members model the often expensive uniforms required for state and regional competitions. Members of Soroptimist International of Grass Valley helped develop the "White Barn Project," which provides new and reused uniforms for 4-H and FFA members in need. Wendy Weidler, a local registered nurse and mother of former and active FFA and 4-H members, came up with a creative idea to help youth afford expensive uniforms. Over the years, she noticed that some children in the programs (ages 5 to 16 years for 4-H and 13 to 18 for FFA) were not be able to present their animals at the Nevada County Fair or other competitions because there were not able to afford the required formal attire in proper sizes for each new year. As a result, Weidler has organized a uniform exchange closet with no fees attached. Membership to the two farming organizations and participating in competitions are the only requirements. When Weidler approached Soroptimist International of Grass Valley (SIGV) for advice and help for “The White Barn” project, they were quick to offer support. A closet featuring used, donated and new uniforms for the all FFA and 4-H youngsters taking part in competitions — will be available prior to the Nevada County Fair at no cost. Kate LaFerriere, Soroptimist member and development director for the Interfaith Food Ministry, has also arranged for uniforms that members have outgrown or no longer use to be donated at the Ministry building in Grass every Tuesday and Thursday. Other locations will soon be secured by committee members and announced. Once uniforms are collected, Soroptimist members will launder and prepare them for distribution. Judy East, club co-president, is purchasing, with SIGV Youth Committee funds, 12 large storage boxes to organize clean clothes by size. A two-day distribution at the fairgrounds on July 20 and 21 will available for members, manned by Soroptimist members under Weidler’s directions. Anyone wishing to donate uniforms or funds to purchase uniforms, can visit http://SIGV.org.